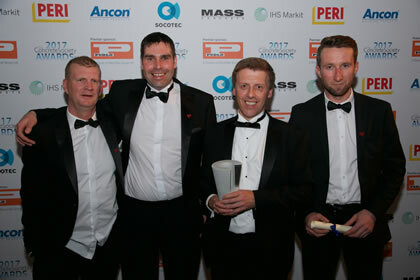 The annual presentation of The Concrete Society's coveted Awards for Excellence in Concrete took place at the The Grosvenor Hotel, Park Lane, London. 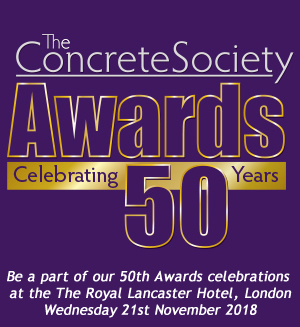 This year's event is scheduled for Wednesday 21st November 2018 at The Royal Lancaster London, if you want to be part of the Awards' experience please contact Sue Courtney either by email or 01276 607170. 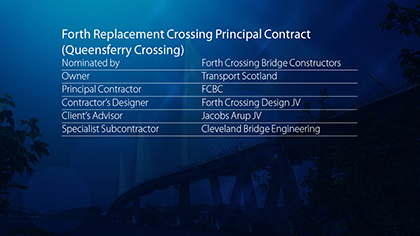 The Queensferry Crossing, with its 200m+ high towers incorporated some 165,050m³ of reinforced concrete, including an underwater continuous concrete pour of 16,896m³ . This bridge is a fine example of creative concrete technology for placeability, strength, durability and finish quality. The flexibility of concrete to serve a number of purposes in the construction is very evident. 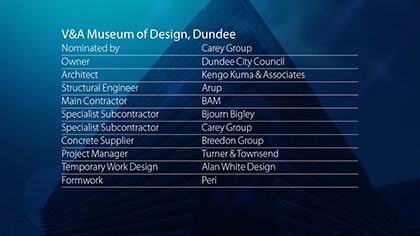 As would be expected with a project of this size and importance, careful design was at the heart of the project. Durability was a key feature both for exposed concrete and especially the ‘splash zones’ in the towers and the general marine exposure conditions. All concrete in both the anchors and especially the towers are of an exceptional finish (bearing in mind that they would not be seen close up) and extreme care was taken to achieve an architectural finish, which is very successful. Particular care has been taken to ensure that the design, materials and construction methods match the very visual nature of the location, the locality and harmony with the older Forth crossing structures. A hybrid design and construction for three new ward buildings and an entrance / administration building incorporated over 6,150 precast concrete components with in-situ reinforced concrete. Offsite manufacture to exacting specification using DfMA and BIM enabled tight tolerances with high quality finishes and ensured rapid construction. 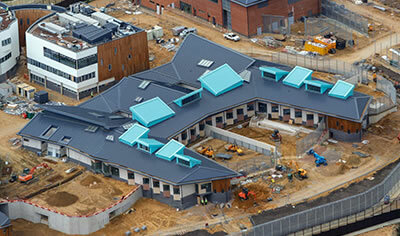 Considerable input from the medical team ensured that this new development improves the functionality of the hospital – no 90° corners for patients to wedge themselves into, no fragile finishes and with calming pastel shades. The corridors narrow to give full visibility to bedroom units by centrally located security personnel. This results in continuous changes to the floor plan. There is an overall calming appearance. Externally, good-quality pigmented concrete picks up the colour of the existing brickwork and blends in with the new buildings. 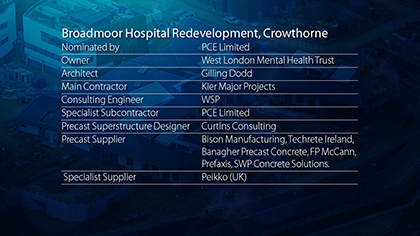 The use of DfMA and BIM maximised efficiencies, reducing delivery loads and waste, hence reducing carbon footprint. Security and robustness are the key aspects of concrete exploited, along with the ability to produce the multiple complex shapes. The buildings were built in order to last for at least 75 years. There is no reason to suggest this working life will not be achieved with form of construction adopted. The use of precast would appear to have brought savings over the competing in-situ bids. A very high-quality finish has been achieved, which probably would not have been possible with in-situ form of construction. 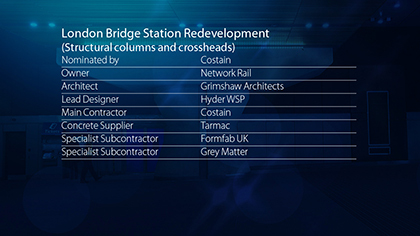 Concrete’s varied properties have been exploited in every part of the £1bn project; 85,000m³ has been used in the complex transformation of London’s oldest train station to increase passenger capacity to 85million a year. The formed architectural concourse columns highlight concrete’s crucial role both structurally and aesthetically. The visual appearance is the key aspect of this submission. The self-compacting concrete has been carefully designed to give a high-quality repeatable finish. The steel formwork was carefully positioned around the column reinforcement so that spacers were not required for the columns. The reinforcement for the crossheads was hung from above so that spacers were not needed. Before each of the six stages of column casting a full-size column was cast (and then demolished) to check that the concrete was consistent with previous pours and that the operatives knew what was required. Any ‘sand runs’ were filled and the whole surface was worked by the specialist subcontractor, filling and carefully staining the concrete to give the finish required. The ability of concrete to flow into a mould and take any form has been exploited in the architectural shaping of these columns and crossheads. The self-compacting concrete was so successful that it was used elsewhere in the project. A top quality example of the use of visually exposed concrete; the execution and finish are exemplary. Consisting of 119 beach huts replacing storm ravaged timber structures, the exposed location favoured concrete, its structural capacity allowing significant enhancements to the schemes functionality, including the creation of a roof top promenade. 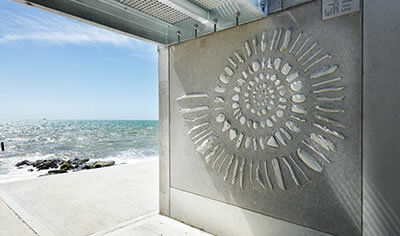 Designed to withstand a 1:200 year storm event, graphic printed concrete and relief artwork surfaces add interest. The submission provided a 3-in-1 result; a sea-defence, promenade and private beach huts, utilising the functional stability of concrete. Overall the visual impression is very pleasing. From the front there is a modern take on the idea of beach huts while from the rear the accessibility and sea view has been improved in relation to the previous individual blockwork huts. 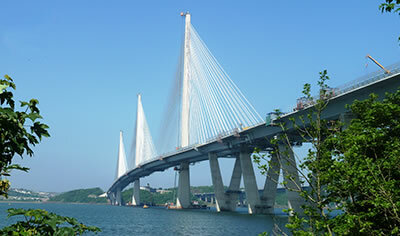 The mix of precast and in-situ gave construction speed and cost effectiveness. The project utilises innovative techniques such as printed graphic concrete and unique Flotsam Jetsam artwork using a Reckli moulding system. Standard culvert C-sections laid on their side provided the basis for a cost effective structural solution. The project was extended by much more than simply replacing the previous beach huts and included a new promenade along the roofs of the huts and steps and ramps for pedestrians. 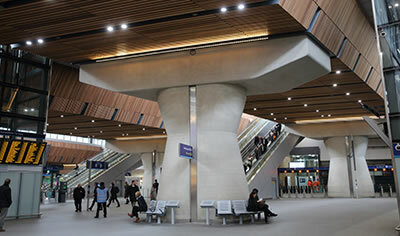 The precast concrete, both artistic and plain, was to a very high standard as was the in-situ concrete. The brush finished walkways were well executed with crisp even lines. Small details such as the ventilation holes set this apart from other projects. There was no visual damage to the precast from lifting and installation. Integrating the huts into a sea defence structure and a new promenade has proved to be a sustainable solution; using local suppliers and services has reduced the environmental impact. 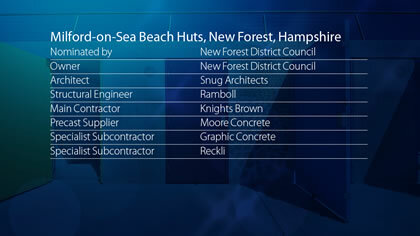 The project also offers very good value for money – £2.3M for 119 beach huts (including a sea defence, walkway, carpark upgrade), especially considering that each hut could sell for £30K. 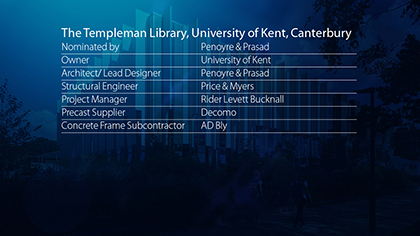 The design for the extension and refurbishment of the Library exploits the aesthetic and formal concrete properties to bring together the new with the existing brutalist building. A collaborative design process enabled optimization of materials and rapid construction process to create a flexible working space with exposed concrete interior and a refined aesthetic façade. This is an extension to a building constructed in phases over the past 50 years, which were predominantly massive brick piers, but with some exposed board marked finish. Internally the older buildings have false ceilings and partitions. 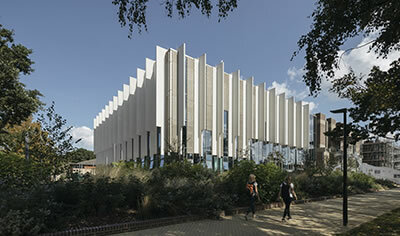 Externally, the new extension mimics the strong vertical lines using precast fins, breaking-up the glass cladding. A reconfigured entrance and atrium of the same architectural style central to the whole building façade provides balance and successfully unifies the old to the new. The interior works well with good foot traffic flow, natural light and ambiance. The exposed surfaces are very good. The coffered roof proved challenging due to the angled grid but overall the effect is impressive. The ground floor has a bonded thin polished screed, which encompasses the level change between front and back and interior steps. An in-situ exposed concrete staircase soffit has a shallow ‘v’ shape, making an attractive feature of a flat detail. Back of house stair cores are as-struck concrete but the natural light keeps this area from being claustrophobic. 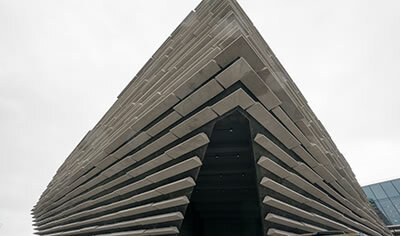 This most iconic concrete structure resembles a section of Scottish rock cliff and a ship by the river bank. 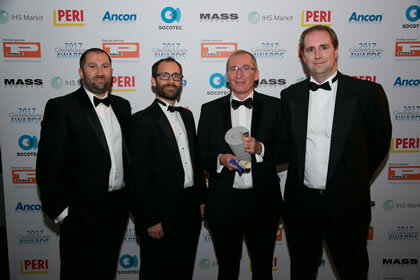 The key challenges include special concrete mix designs, complex building geometry and accuracy in setting out, temporary work design and logistics in construction. The demanding curves and overhanging walls of varying thickness could only have been created in concrete. The structure itself is a ‘piece of art’ and the designer’s intent was for it to resemble a Scottish cliff face in its final external appearance and also as a ship by the bank of the river. As this is the first building as part of the riverbank development it is very striking and unlike any of the older buildings. The intent is for it to be different rather than harmoniously blending into the locality. The concrete at the heart of the building is a structural shell and as such serves its purpose well. It complements the final precast elements that cover the structure. The curves, overhanging walls of varying thickness were a demanding challenge that could only have been created in concrete. The expectation of the material from both a structural integrity and external finish was very high and the contractor had to constantly redesign mixes and placing practicalities as the structure progressed. The whole building then had to support the heavy precast element hung on all surfaces of the finished structure. The black colour and the varying surfaces were extremely challenging and were well executed. The formwork had to stay in place till the roof was on to both support the roof and the unsupported angles and overhanging curves of the building so the final finish was not seen until after this was removed. CRL worked in challenging conditions to provide extensive sympathetic structural repairs and to install an impressed current cathodic protection system to the Coronation Parade promenade/breakwater in Folkestone. 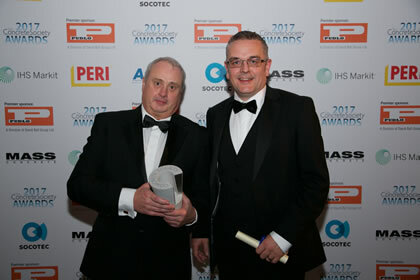 The British Ready-Mixed Concrete Association Award for Excellence in Customer Service is presented in recognition of the exceptional efforts of a ready-mixed concrete producer in anticipating and fulfilling their customer’s needs. 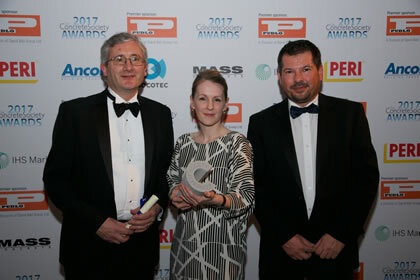 The judging panel considered each entry in terms of the difficulties overcome, quality of service and client satisfaction. 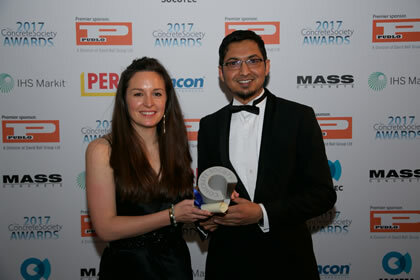 This year, in recognition of a body of work, including Victoria Gate, Leeds, Southampton Westquay, Eastland Melbourne and the Cornich in Doha, Qatar we are pleased to announce the winner for Creativity in Concrete will be ACME Architects.